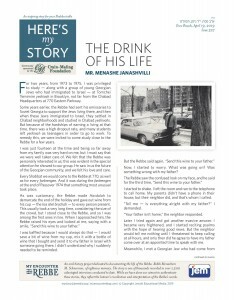 My Encounter with the Rebbe records the oral histories of individuals who interacted with the Rebbe, Rabbi Menachem M. Schneerson of righteous memory, through videotaped first-person interviews. Please help us save these precious testimonies! For two years, from 1973 to 1975, I was privileged to study – along with a group of young Georgian Jews who had immigrated to Israel – at Tomchei Temimim yeshivah in Brooklyn, not far from the Chabad Headquarters at 770 Eastern Parkway. Some years earlier, the Rebbe had sent his emissaries to Soviet Georgia to support the Jews living there, and then when these Jews immigrated to Israel, they settled in Chabad neighborhoods and studied in Chabad yeshivahs. But because of the hardships of earning a living at that time, there was a high dropout rate, and many students left yeshivah as teenagers in order to go to work. To remedy this, we were invited to come study close to the Rebbe for a few years. I was just fourteen at the time and being so far away from my family was very hard on me, but I must say that we were well taken care of. We felt that the Rebbe was personally interested in us; this was evident in the special attention he showed to our group. He saw in us the future of the Georgian community, and we felt his love and care. Every Shabbat we would come to the Rebbe at 770, as well as for every farbrengen. And it was during the farbrengen at the end of Passover 1974 that something most unusual took place. I was baffled because I would always do that – I would save a bit of wine from my cup, mix it with a bottle of wine that I bought and send it to my father in Israel with someone going there. I didn’t understand why I suddenly needed to be reminded. In Long Beach, California, where I live and serve as Chabad emissary, we have a beautiful mikveh – the ritual pool which women use to fulfill the mitzvah of Taharat Mishpachah, the Law of Family Purity. This beautiful mikveh was built because of the Rebbe’s initiative, which started a chain-reaction of building beautiful mikvehs throughout America. Mikvehs have not always been beautiful – typically, they were utilitarian places, with concrete floors and basic furnishings. Many people thought of them as unpleasant. Of course this perception affected mikveh use, especially by the post-war generation which did not grow up with the same strong commitment to Yiddishkeit as the generation of pre-Holocaust Europe. So, in the early 1970s in Long Beach, there was little interest in having a mikveh at all. The few women who observed the Laws of Family Purity traveled to Los Angeles – a thirty-minute ride – to use the mikveh there. Yet, one Sunday morning in the fall of 1971, Rabbi Ephraim Piekarski, another emissary in town, got a call from Rabbi Binyomin Klein, the Rebbe’s secretary, saying that “since building a mikveh in Long Beach is very important, in order to encourage it, the Rebbe is sending an advance of one thousand dollars for this project by special delivery.” Not only that – twenty minutes later Rabbi Klein was on the phone again asking to speak to Mrs. Chana Piekarski. He repeated the same message, saying that the Rebbe insisted that he call again and give the message directly to the wife. That really underscored to us how important this mikveh was to the Rebbe. But his message took us all by surprise since we had not written to him about a mikveh in the first place. Furthermore, we had no plans to build a mikveh, so we had no idea what this was about. 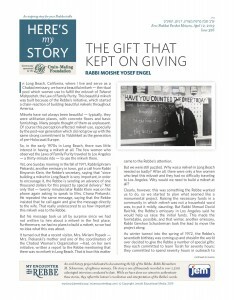 It turned out that a recent visitor, Mrs. Miriam Popack – Mrs. Piekarski’s mother and one of the coordinators of the Chabad Women’s Organization – had, on her own initiative, written a report to the Rebbe mentioning that there was no mikveh in Long Beach. That is how this matter came to the Rebbe’s attention. I grew up in Melbourne, Australia, in a home that was traditional but not observant. However, my parents sent me to a Lubavitch school from the age of eleven where I was greatly inspired by one of my teachers, Reb Shmuel Yelen, and I began to observe more of the mitzvot. By the time I was a teenager, this was causing tension at home as my father and mother were concerned that I would not be able to support myself if I opted to learn in a yeshivah instead of attending university. I was respectful of them – as is the Torah way – but I also knew my path. So I told them that I planned to defer enrolling in university and would, instead, enroll in the Chabad Yeshivah Gedolah in Melbourne. I did this in 1972 against their wishes. While in yeshivah I won the Australian “Bible Quiz” for which the prize was a trip to Israel to represent Australia in the international Bible Quiz in Jerusalem. At that stage, my parents were proud of me. After a year in the yeshivah, I entered the University of Melbourne, as my parents wanted me to, while continuing to be involved with Chabad and its outreach activities on campus. I took a break in the Australian summer (which corresponded to the New York winter of 1974-75) and came to Brooklyn, to study for a few months at the Chabad yeshivah there and to meet the Rebbe. 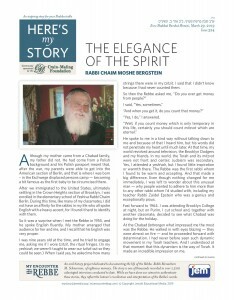 The chasidim did not make such a great impression on me, but the Rebbe was just amazing – he had a regal demeanor yet, at the same time, a great humility emanated from him, and I felt strongly that I was in the presence of a true spiritual leader. In January of 1975, I merited to have a private audience with the Rebbe. As I was waiting for my appointment, I could feel the emotion building inside me – I was going before a tzaddik to discuss lifelong questions and dilemmas that would affect me and my family, and maybe even future generations. It was definitely a monumental moment for me. When I was a young man, I was dispatched by the Rebbe to Israel, along with a group of other yeshivah students from New York. We were to study during the day at the Tzemach Tzedek Chabad synagogue in the Old City of Jerusalem and, during the evenings, at Yeshivas Toras Emes in Shikun Chabad in central Jerusalem. And we were also to do outreach work in various locations in Israel. 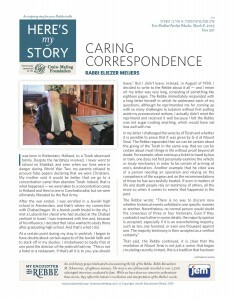 Before we left for Israel in the spring of 1976, the Rebbe repeatedly spoke about our mission and even said that he was taking personal responsibility for our welfare. So we set off with great excitement, particularly because we would be in Israel for Purim, and we would get to distribute holiday food packages, mishloach manot, to the soldiers on army bases. We had heard the Rebbe speak many times about the merit of the soldiers who defend the Holy Land with their lives, and therefore we waited impatiently for this opportunity to bring them joy. The packages to the soldiers were from the Rebbe himself – that is, they were funded by him personally – so it was a special honor to deliver them. When Purim came, I was dispatched with three other chasidim from Israel in the back of a military vehicle to an IDF base near the Arab city of Nablus, known to Jews as Shechem. We were about two kilometers from our destination when suddenly the car stopped. We didn’t understand what was going on because we couldn’t see from the back of the vehicle; we just heard yelling. After a few minutes, the driver came around to tell us that we couldn’t go forward because about twenty meters up ahead was a blockade of stones and burning tires. Also, up on the hill, over a hundred Arab youths were gathering armed with stones, which they started to hurl at us though they were too far away to cause any harm. The driver would not take responsibility for bringing us across the blockade and putting us in danger. But I tried to convince him that we had no choice; we had to move forward because we were on a mission from the Rebbe. 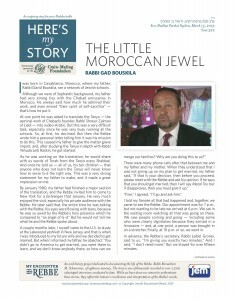 I was born in Casablanca, Morocco, where my father, Rabbi David Bouskila, ran a network of Jewish schools. Although we were of Sephardic background, my father had very strong ties with the Chabad emissaries in Morocco. He always said how much he admired their work, and even envied “their spirit of self-sacrifice” – that’s how he put it. At one point he was asked to translate the Tanya – the seminal work of Chabad’s founder, Rabbi Shneur Zalman of Liadi – into Judeo-Arabic. But this was a very difficult task, especially since he was very busy running all the schools. So, at first, he declined. But then the Rebbe wrote him a personal letter telling him it was his mission to do this. This caused my father to give the matter grave import, and, after studying the Tanya in depth with Rabbi Yehuda Leib Raskin, he got started. As he was working on the translation, he would share with us words of Torah from the Tanya every Shabbat. And once he told us – all of us, his ten children – that anyone who does not learn the Tanya will never know how to serve G-d the right way. This was a very strong statement for my father to make, and it made a great impression on me. By January 1980, my father had finished a major section of the translation, and the Rebbe invited him to come to New York for a farbrengen that January. He very much enjoyed the visit, especially his private audience with the Rebbe. He later said that, the entire time he was talking with the Rebbe, his eyes were flowing with tears, because he was so awed by the Rebbe’s holy presence which he compared to “an angel of G-d.” But he would not tell me what he and the Rebbe spoke about. I was born in Rotterdam, Holland, to a Torah observant family. Despite the hardships involved, I never went to school on Shabbat, and even when our lives were in danger during World War Two, my parents refused to procure false papers declaring that we were Christians. 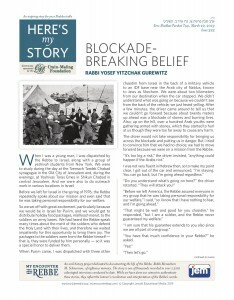 My mother said it would be better that we go to a concentration camp than abandon Torah. Indeed, that is what happened – we were taken to a concentration camp in Holland and then to one in Czechoslovakia, but we were ultimately liberated by the Red Army. After the war ended, I was enrolled in a Jewish high school in Amsterdam, and that’s where my connection with Chabad began. At a Jewish youth hostel in the city, I met a Lubavitcher chasid who had studied at the Chabad yeshivah in Israel. I was impressed with him and, because of his influence, I decided that I also wanted to study there after graduating high school. And that’s what I did. At a certain point during my stay in yeshivah, I began to have doubts about certain aspects of the Jewish faith and to slack off in my studies. I misbehaved so badly that at one point the director of the yeshivah told me, “This is not a hotel or a restaurant. If that’s all it is to you, you should leave.” But I didn’t leave. Instead, in August of 1959, I decided to write to the Rebbe about it all – and I mean all: my letter was very long, consisting of something like eighteen pages. The Rebbe immediately responded with a long letter himself in which he addressed each of my questions, although he reprimanded me for coming up with so many challenges to Judaism without first putting aside my preconceived notions. I actually didn’t mind the reprimand and received it well because I felt the Rebbe was not sugar-coating anything, which would have sat less well with me. But around the time I turned five, something changed. In the beginning of 1958, my father was released from the hospital, and we went to live in Gateshead. That is where life returned to normal, I went to school and all was well. Simcha then went on to relate that during his last days, my father had a visitor, Reb Yisrael Rudzinski, who had gone with him through the camps during World War Two. Reb Yisrael was a Bobover chasid, a tailor by profession, and he was among my father’s closest friends, the survivors who shared every family celebration with us. When he came to visit my father for what turned out to be their final meeting, my brother left the two of them to speak together in private. 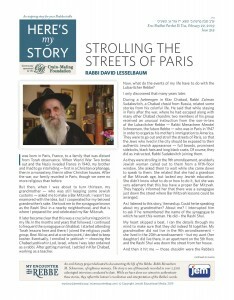 I was born in Paris, France, to a family that was distant from Torah observance. When World War Two broke out and the Nazis invaded France in 1940, my brother and I had to go into hiding – first in a Christian orphanage, then in a monastery, then in other Christian houses. After the war, our family reunited in Paris, though we were no more religious than before. But then, when I was about to turn thirteen, my grandmother – who was still keeping some Jewish customs – asked me to make a Bar Mitzvah. I wasn’t too enamored with the idea, but I cooperated for my beloved grandmother’s sake. She took me to the synagogue known as the Rashi Shul in a nearby neighborhood, and that is where I prepared for and celebrated my Bar Mitzvah. It later became clear that this was a crucial turning point in my life. In the months and years that followed, I continued to frequent the synagogue on Shabbat; I started attending Torah lessons here and there; I joined the religious youth group, Bnei Akiva; and at a certain point, I decided to keep kosher. Eventually, I enrolled in yeshivah – choosing the Chabad yeshivah in Lod, Israel, where I was later ordained as a rabbi. After getting married, I settled in Kfar Chabad, working as a teacher. Now, what do the events of my life have to do with the Lubavitcher Rebbe? I only discovered that many years later. This is how my work as librarian began. For eight years I managed the Ponevezh Yeshivah’s library, which is considered a huge library in the yeshivah world, housing some twenty-five-thousand books. Through my work I learned to recognize the issues and challenges involved in organizing such a large collection, and on the Rosh Yeshivah’s advice, I enrolled in professional courses in library science. During my studies, I discovered that there were simple and effective solutions to the issues that I was struggling with, and I thought that it would be good for other Torah librarians to know about these solutions. This is how the idea to open a Center for Torah Libraries came up. 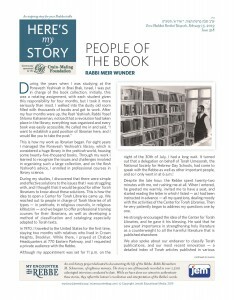 We reached out to people in charge of Torah libraries of all types – in yeshivahs, in religious councils, in religious kibbutzim – and we began to offer professional training courses for their librarians, as well as developing a method of classification and cataloging especially adapted to Torah texts.